Monarch Air Group provides private air charter in Winston-Salem, NC. Our clients benefit from top-notch service, unrelenting dedication to safety, wide selection of aircraft, and years of experience in chartering private jets. To obtain a free quote, please use our online quoting tool provided below, or call toll free 1-877-281-3051. Monarch Air Group provides private jet charter flights in and out of Winston-Salem, North Carolina, USA. Winston-Salem is an industrial and commercial city in north central North Carolina. A total area of the city is132.4 square miles and a population is about 229,617 people. 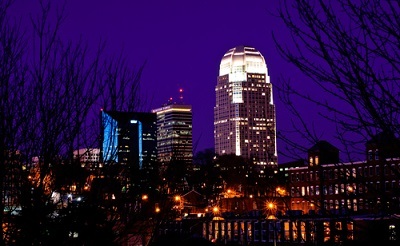 Winston-Salem is the largest city and the county seat of Forsyth County as well as the 4th largest city in the state. The city is well-known for being home to R. J. Reynolds Tobacco Company. The most popular tourist attractions include Reynolda House Museum of American Art, God’s Acre, Bethabara Park, Old Salem Museums & Gardens, Children’s Museum of Winston-Salem, Frank L. Horton Museum Center, Olde Homeplace Golf Club, and much more. The nearest airport is Piedmont Triad International Airport (GSO / KGSO), which is located 23 miles from the city. 4. HKY, Hickory, Hickory, United States. 5. IKB, Wilkes County, Wilkesboro, United States. 6. INT, Smith-Reynolds, Winston Salem, United States. 7. QWG, Wilgrove Air Park, Charlotte, United States. 8. SRW, Rowan County, Salisbury, United States. 9. SVH, Municipal, Statesville, United States. 10. ZEF, Elkin Airport, Jonesville, NC, United States. 1. Comfort Suites Winston-Salem, 200 Capital Lodging Court, Winston-Salem. 2. Holiday Inn Express, 2520 Peters Creek Parkway, Winston-Salem. 3. Holiday Inn Express, 110 Miller Street, Winston-Salem. 4. Comfort Suites Winston-Salem, 200 Capital Lodging Court, Winston-Salem. 5. Clarion Collection Hotel Sundance Plaza Hotel Spa & Wellness Ctr., 3050 University Pkwy, Winston-Salem. 6. Holiday Inn Express, 2520 Peters Creek Parkway, Winston-Salem. 7. Holiday Inn Express, 110 Miller Street, Winston-Salem. 8. Comfort Suites Winston-Salem, 200 Capital Lodging Court, Winston-Salem. 9. Clarion Collection Hotel Sundance Plaza Hotel Spa & Wellness Ctr., 3050 University Pkwy, Winston-Salem.